Top 10 Sectors Account for 70% of Total Spend. 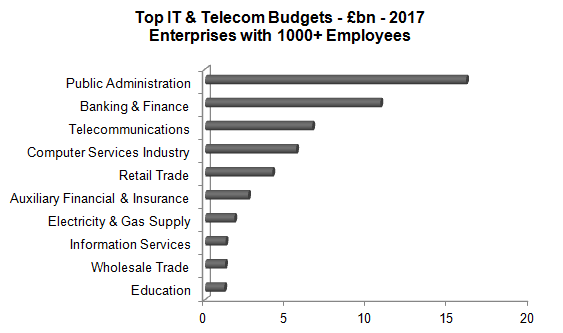 Public administration tops the spend on IT & Telecom by large UK enterprises (1000+ employees). In 2017 public administration contributed over 20% of all such spend. The top 3 spenders represent almost a half of the UK outgoings. This is out of 80 sectors representing the whole of the UK economy. Whilst large enterprises in the top 10 sectors account for 70% of total spend, they represent 60% of the employees and 45% of the enterprises. R&D firms, with 100-999 employees, are each typically spending £140k on application packaged software during 2017. 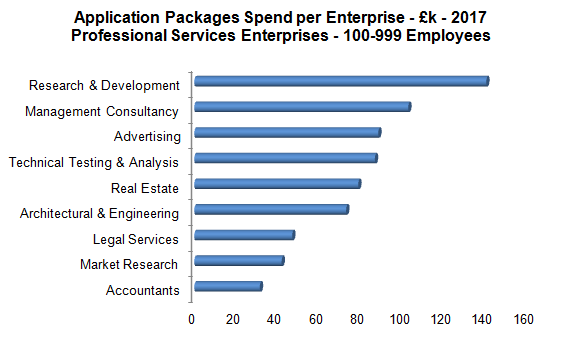 In terms of individual company expenditure they are the biggest spenders amongst medium sized professional services firms. Their spend level contrasts markedly with accountants where the corresponding value is only £32k. There are 2,000 medium sized professional services companies in the UK. Of these there are 140 R&D firms and 155 accountancy firms. Real estate companies are the most numerous with a count of 405. These companies have an average outlay of £80k which gives a total spend of £32m for all medium sized real estate enterprises. This makes them by far the largest sub sector within the medium sized professional services market. 2017 Spend to Grow 7%. Large retailers spend £2,000 per employee on IT & telecom products and services. This is dramatically less than the corresponding outlay by all UK large organisations which stands at over £5,500. 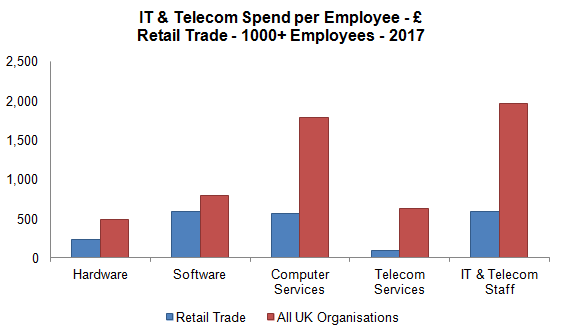 Large retail traders’ expenditure on both computer services and IT & telecom staff are a third of that by the rest of UK large enterprises. The comparable investment in telecom services is even lower at one seventh of the UK norm. Budget 40% Larger than UK Norm. 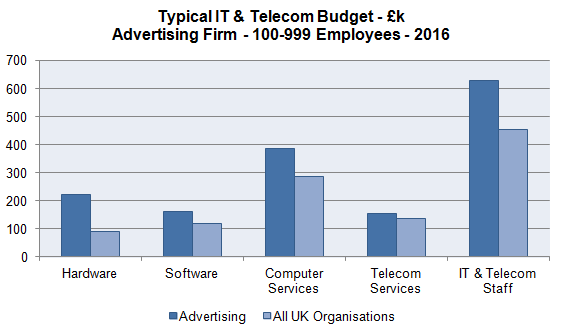 Medium sized advertising firm (100-999 employees) typically has an IT & telecom budget of over £1.5m. This is 40% greater than the value for all medium sized organisations in the UK. Staff is the largest budget component for medium advertising companies representing 40% of the total spend. The next largest is computer services at 25%. Top Dozen Sectors Account for Half the Total Spend. Wholesalers top the spend on IT & Telecom by small enterprises (50-99 employees). They account for 10% of the UK total whilst the top dozen sectors are responsible for half. The top 3 spenders represent a quarter of the UK outgoings by small enterprises. This is out of 80 sectors representing the whole of the UK economy. Application Software Up by 33%. 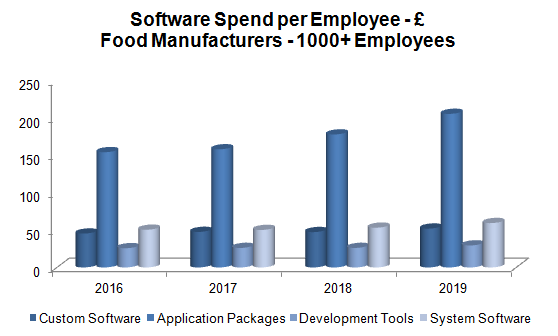 Large food manufacturers are to increase their spend on application software by a third. In 2016 the outlay is £155 per employee but this will increase to over £200 by 2019. Application software is also by far the largest component of overall software expenditure with a 60% share. 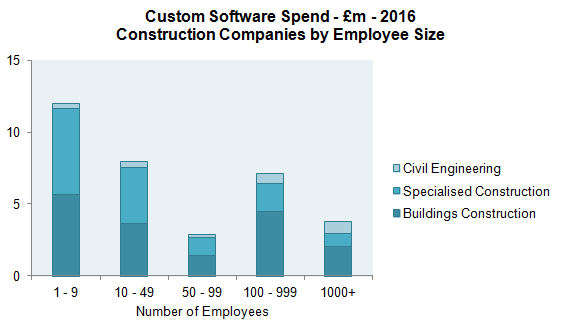 The smallest SMEs in the construction industry are spending over £10m on custom software. By contrast large enterprises (1000+ employees) are expending a third of that amount. Within the whole of the construction industry, buildings construction companies lead the way with an expenditure of £17m. Specialised construction firms are close behind on £14m. Beverages & Tobacco Manufacturers are Top Spenders. 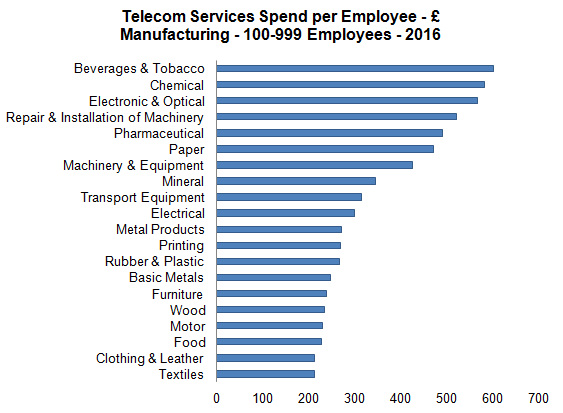 Beverages & tobacco manufacturers top the list of medium sized manufacturers’ spend on telecom services. Their outlay is around £600 per employee which is 75% above the average for all medium sized manufacturers. Clothing & leather and textiles manufacturers make the least commitment with their expenditure a third below the norm. Spending Double the UK Norm. 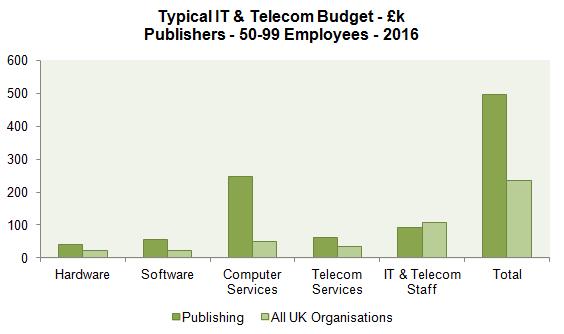 Small publishing companies (50-99 employees) each typically have a budget of around £500k for IT & Telecom products and services. This is twice the amount invested, on average, by each small UK enterprise. 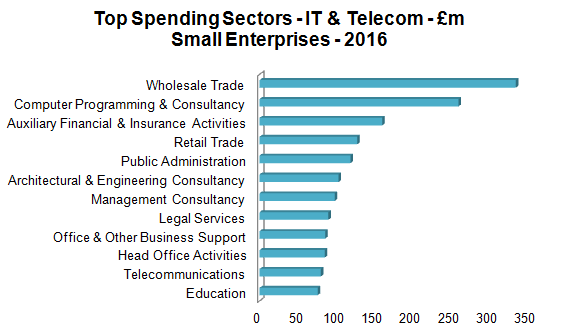 Computer services outlay dominates small publishers’ budgets with half the spend whilst small UK organisations have the largest commitment to IT & Telecom staff. 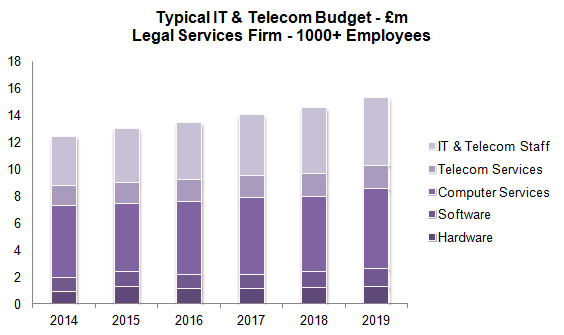 A legal firm with 1000+ staff is typically expected to increase its total IT & telecom budget by 23% between 2014 and 2019. IT & telecom staff is forecast to be the fastest growing spend category and that is followed by hardware. The slowest growing element will be computer services expenditure although it will continue to be the largest in absolute value.